Men Must Cease Offending God, Who Is Already Too Much Offended! In November 1961, in New Delhi-India, Patriarch Nikodim of the Russian Orthodox Church laid down the conditions of the Kremlin which had to be accepted before they would attend the Vatican Council-II. The Vatican-Moscow Agreement is no secret. In early 1962, the pledge was signed by the Vatican that no hostile declaration would be made by the Council against Russia. Communism was not to be mentioned. And, today, we are told that Communism is dead. Yet, it marches on to engulf the world with its doctrines and iron fist. We will know that the Immaculate Heart of Mary has Triumphed as She promised, when the Holy Father united with all the Bishops gather in Rome to define the third and final Marian dogma that Our Blessed Mother is the Mediatrix of all Graces and Co-redemptrix of the world. This Triumph will be the outward sign of the consecration of Russia. Then, the Sacred Heart and the Immaculate Heart will reign on earth as They do in Heaven. Peace will be given to the world. IT IS THE WILL OF GOD! The Holy Ghost is God. The Blessed and ever-virgin Mary is His Immaculate Spouse. Of Mary, there can never be enough! What is given to Her is given to Him! O Mary conceived without Original Sin, pray for us who have recourse to thee and for those who do not have recourse to thee, especially for the enemies of Holy Mother the Church. The name of Lucifer is LEGION. He is constantly changing his name and his image, but his indelible mark remains unchanged: hatred of the Church, hatred of the just and hatred of the Immaculate Mother of God. The Holy Ghost is the principle of the life of the Church and, therefore, the source of Her holiness and Her unity. Disunion from this life results in death. Arrogant and disciplined by an inhuman mystique, the enemy applies methodically, point-by-point, his plan of extermination. Mary the Immaculate is our direct way to Jesus Christ. She is the weapon of conquest with which to establish the reign of Jesus Christ universally from one end of the earth to the other! Nothing must sorrow the Holy Ghost quite as much as the mediocrity of we who are vowed to His Spouse. Embracing the Blessed Virgin Mary, the principle dogmas of our Faith are read, grasped, loved and believed. Our Blessed Mother contained and contains the Gospel which She offers to us through the Mysteries of the Holy Rosary! She is the fountain of grace which is poured out upon us through her powerful Sacramentals of the Holy Rosary and the Scapular of Mount Carmel. True Christians can be recognized by their IMMENSE love for the Mother of God, but nothing short of IMMENSE! The Immaculata will impart to us a deep love for Her Divine Spouse and obtain for us the fullness of His Gifts. We are on all sides surrounded and pressed by the spirit of the world. Never in any other Age has the hostile spirit of the world risen up so mightily against the Kingdom of the Holy Ghost, Holy Mother the Church. Never has apostasy from the faith been more general, nor presumption more extreme, nor hatred and jealousy between nations more ferocious. Our Age is identified by sin against the Holy Ghost. In this Age, a religion, peculiar to itself, is here. The worship of the devil has affected apostasy from the truth and confusion of the mind. Ours is an Age of spiritual darkness, lies, godlessness and despair. Sin is the evil which surpasses all other evils put together, destroying our union with God and man, annulling our claims to future happiness, rendering us victims of eternal misery and deranging the harmony which should exist between nature itself and the human soul. Owing to our want of thought, sin reigns everywhere in all shapes of corruption and disorder. Its dominion is universal, extending through all the paths and avenues of society, infecting every state and condition, defiling each Age, and tainting alike both men and women. Sin is the rejection of God’s authority, our positive refusal to submit to His Commandments, an act of downright rebellion against Him. The ingratitude which it implies is the blackest of all ingratitude – total disregard for a father, benefactor, lover and friend. By sin, we positively trample His mercies and His kindness under our feet. We may form our idea of the atrocity of any crime by the weight and nature of the punishments which are inflicted because of it. When our first parents sinned, God visited them with the severest penalty. He converted His Paradise of delights into a vale of tears; and His promise of immortality, He changed to a sentence of death. About the ‘rights of man’ – as they are called – ¬the people have heard enough! IT IS TIME WE SHOULD HEAR ABOUT THE RIGHTS OF GOD! The Name of God is not hallowed as It should be, if It is not hallowed publicly and so¬cially. Our Lord’s Kingdom is meant to come, not only in individual souls and in Heaven but on earth, through submission of States and Na¬tions to His rule. The Catholic is not a being who shuts himself up in an oratory occupied exclusively with his own soul and takes no in¬terest in the world. Catholics must never relinquish the struggle for God’s Rights. Let him never be resigned to the dethronement of Christ the King. The dethronement of Jesus Christ the King is a crime! We come into union with Our Lord, not as isolated individuals, but as members of a supernatural organism, the Mystical Body of Christ. Through Baptism, we are incorporated into this organism of which Christ is the invisible Head. All members of this organism are united battling for the Divine Order of the world. The supernatural life is not the life of a soul, but the life of a Member of Christ, composed of soul and body, occupying a place in an organic unity destined to mold the world for Christ. We must affirm unflinchingly that this Supernatural Grace is infinitely superior to every nation and every race. The violent attack of today upon this Supernatural Life of the world must be countered with an energetic defense. Let all good men unite and form an immense association of action and prayer. As we have seen the REVOLUTION launched by the declaration of the Rights of Man and the social expulsion of Jesus Christ, may we see the same Revolution come to an end by the universal recognition of the RIGHTS OF GOD and of the duties of the human race to its Savior and King! If Jesus Christ be excluded, human rea¬son is left without its greatest protection and illumination. Belief in Christ will not be preserved true and genuine if not supported and protected by belief in the Church which is the pillar and ground of truth. His command to hear His words in the words and commandments of the Church is meant for the men of all times and all places. All attempts to dislodge this teaching and truth from the rock of faith, sooner or later, lead the individual and community to moral destruction. Christian marriage, the foundation of the Christian Fam¬ily, as the Symbol of the union of Christ and His Mystical Body, is ONE AND INDISSOLUBLE. The fundamental doctrine of Natural¬ism or Rationalism is the supremacy of human reason which, refusing due submission to the Divine and Eternal Reason, proclaims its own independence. The great error of this Age is that religion is a matter of indifference and that one religion is as good as another. Such an attitude spells the ruin of all religions, but it is the grav¬est injustice and worst form of insult to the one True Religion. The term liberty is made use of in order to justify abuses and excesses. Modern society, under the influence of Satan, is organ¬ized upon the principle that human nature is of itself divine, that man is God and therefore subject to nobody. Dear Patti,Remember, several times I had told you when you depart from this world and arrive into the Presence of the Lord, you will find out how many people you helped with your religious material. Well, sometimes our Merciful Lord lets us know some fruits of our work to encourage us to continue doing this work. You sent me some books, The Stations of the Cross that I distributed in 3 Churches. One of those was at St. Philip Neri. There, I gave this book to a lady. I saw her come into the church once in a while. I offered her the book after the Mass at 11:15 on the First Sunday of Lent. I spoke to her about The Stations of The Cross and the great help that brings to our souls to do it especially during Lent. She took it and went home. Then, I saw her the next day at the 12 noon Mass and she was doing the Stations of the Cross. It made me very happy. To make a long story short, I saw her doing it daily. Two weeks before the Holy Week, I offered the book, Reign with Christ. She took it and told me very emotionally, “Luisa, you have no idea how much you helped me with the ‘The Station of The Cross’ book. I am meditating on it every day.” It touched me very deeply and brought me closer to the Lord. For a long time she had been looking for a 2 bedroom apartment. Her brother is very sick. He is confined to his bed and needs help. She had been spending a lot of time and money on applications in looking for it, without any success. One day, when she was praying to the Lord close to the Tabernacle, it came to her head so clearly to go to visit her brother. She said that was Divine inspiration. She felt it and went to visit him and, among his mail, she found an application for a two bedroom apartment. She completed the form, sent it out and he got the apartment. She is now attending Mass and receiving Communion daily. She said that she is a different person. She is evangelizing to her daughters, son and her sister. She wants to bring them closer to the Lord (I don’t remember if she is evangelizing to her brother). She asked me to send by mail every new book. She will be moving in May to Syracuse with her brother. She got the 2 bedroom apartment and the rent is not too high. She feels full of faith and wants to help her brother more than ever. She said that the great faith that she is feeling and experiencing is beautiful. She has a new life, a new vision and is focusing to be a better Christian. She told me all of that very emotionally. She loves the book, ‘The Stations of The Cross’ and she treasures it. Now, I let you know one of the fruits of your work. God wanted you to know about it. When Adam, deprived of the state of grace, was driven from Paradise, only one ray of hope illumined the darkness of fallen humanity: “I will put enmities between thee and the woman,” God said to the serpent, “and … She shall crush thy head.” She will always be the spotless and immaculate one belonging wholly to God: whom He will introduce into the circle of His Divine Family by bonds of the closest intimacy with each of the three divine Persons: “Daughter of the Father, Mother of the Son, Spouse of the Holy Ghost.” Mary lived her divine filiation in humble dependence and loving adherence to God’s every desire. Mary lived not only God’s manifest Will, but His Will of permission, as seen by her loving acceptance of all: the long journey to Bethlehem when She was about to bring into the world the Son of God, the poor humble shelter of the stable, the flight into Egypt by night, the loss of Jesus in the temple, a life of poverty and weariness, and finally the disgrace of the Passion and Death of her beloved Son on Calvary. What an example of humble dependence on God, absolute fidelity to His Will, perseverance in spite of the difficulties and sacrifices She had to encounter! Mary lived only for God. We never see her influenced by selfish motives or by personal interest; only one thing moved her: the Glory of God and the interests of Jesus and of souls. All of Mary’s greatness and glory are explained in the light of her divine maternity; furthermore, her very existence is explained by her predestination to this high office. We love and honor Mary because She is the Mother of God. Our devotion to her makes our love for God and for Jesus, deeper and more tender. God could make a bigger world or a wider sky, but He could not raise a pure creature higher than Mary, for the dignity of Mother of God is the highest dignity that can be conferred on a creature. No one could ever say more truly than Mary: “I live now, not I, but Christ liveth in me!” Immense, marvelous mystery! With what great reverence, honor and devotion, we should salute Mary, who drives away demons, frees sinners and makes her children rejoice. When Mary agreed to be the mother of the Savior, She also agreed to become the closest collaborator of His mission. If Jesus is the Father of our souls, Mary is their Mother, for in giving us Jesus, She gave us true life and, later, by offering on Calvary the Life of her Son for our salvation, She brought us forth to the life of divine grace. In all truth, we may address her: “Hail, Holy Queen, Mother of Mercy, our Life, our Sweetness and our Hope!” On earth, Christ’s dearest possession had been His Mother. As co-redemptrix, She procured the life of grace for us; therefore, She is the woman who in the supernatural order gives us life: She is our Mother! God lives in Mary and Mary lives in Him. Mary clothed Him with the substance of her flesh and He clothed her with the Glory of His Majesty. Mary is the most perfect image of Christ truly formed by the Holy Ghost. Take mine and transform it! MAY IS THE MONTH OF MARY, OUR MOTHER. WHAT GIFT CAN WE GIVE THAT WILL PLEASE HER! We could offer Mary our will, but it is not conformable to God’s Will. We could offer Mary our intellect, but it is not enlightened. We could give Mary our affection, but it is not pure. Ah! let us offer Mary, our Mother, the Heart of her Divine Son! During the month of May, hasten to bring to Our Blessed Mother the only gift that is sure to honor and please her Immaculate Heart: The Eucharistic Heart of Jesus! In the midst of a godless world, there is but one means of preservation from eternal ruin, one means of perseverance in the great tribulation of life, the Most Blessed Sacrament. Protected by this Shield, the Children of Mary will remain firm in the Faith. In the Holy Eucharist, there is a joy which cannot be described. Jesus in the Tabernacle protects us against all our enemies: against the evil spirit, the world, our wicked passions and evil inclinations. Jesus supports us in our weakness, comforts us in suffering, is our weapon in combat, our refreshment in heat, the food of our souls and our strength in exhaustion. The Eucharistic Heart of Jesus in the Tabernacle is our Heaven on earth, our riches in poverty, our defense in calumny and crown in misfortune. Jesus in the Tabernacle is our God and our All! Let the flame of our faith be bright and let our confidence be unlimited; but above all, let our love be aglow. Jesus wills to be loved; let us give Him our love! Although we have squandered the powers of our souls and perverted the safeguards of our hearts, Our Savior is ready to receive the shipwreck of humanity if only we will return to Him with sorrow and love. Palaces of this world are inhabited by earthly kings, but within the Catholic Church dwells the King of kings, the Lord of Heaven and earth. What ineffable joy we give the Immaculate Heart of Our Blessed Mother by bringing souls to the Foot of the Altar that She may give to them the Eucharist Heart of her Divine Son! In doing this, we render to God the Father thanksgiving and reparation for the sins of mankind. In honor and obedience, thanksgiving and petition, entrust your loved ones to Mary through the gift of a special Bouquet of 31 days of Holy Masses. Place on her head a crown of roses empurpled in the Precious Blood of her Divine Son, the Source of all Salvation! A lovely Mass card will be sent out to you for each person you enroll. Let us sacrifice ourselves to hasten the Triumph of the Immaculate Heart of Mary. SUGGESTED STIPEND DONATION: $5.00 each for Enrollment in the MAY Bouquet of thirty one days of Holy Masses for your Loved Ones: PRINT VERY CLEARLY EACH NAME! This is the box we send out to the foreign Missi4 lb. box @ $53 (in place of $42.70), 20 lb. box @ $95 (in place of $86.25), 1 lb. package @ $22 (in place of $20)7.95. 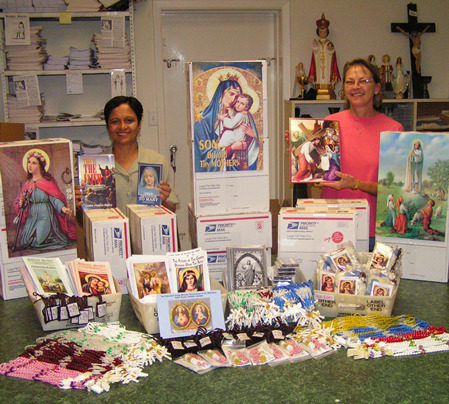 It contains Rosaries, Scapulars, Miraculous Medals, Cord & Oil, Newsletters, Calendars, Catechism books, 2 TAN books, large color prints, lists and encouragement for our Promoters. This entry was posted on Wednesday, April 20th, 2016 at 10:58 pm and is filed under Catholic Rosary, NewsFlash, Saint, Saint Philomena. You can follow any responses to this entry through the RSS 2.0 feed. Both comments and pings are currently closed.